Video: The theme of this year’s event is, “A World of Stories.” Looking at the lineup of keynote speakers this year, you can see another theme – video. Actor Joseph Gordon Levitt, who founded and directs hitRECord, an open collaborative production site. Casey Neistat of YouTube fame. Of course, by now, many brands know the importance of incorporating video into their strategies, but some are still struggling to do so. The thing to remember is—video is not going to get LESS important. So, it may be time to embrace it and figure out how to make it happen. Writing: When Joe Pulizzi sifted through feedback about last year’s #CMWorld, requests for more writing sessions topped the list. This is GREAT news because people need help with their writing. No matter where they may be in their careers, it seems many folks struggle with this. The fact that people are beginning to understand this—and seek out ways to improve—makes me happy. And P.S. : Writing is my personal passion. Ann Handley: Speaking of writing, no CMWorld would be complete for me without hearing Ann Handley, who continues to reign as one of my favorite authors, experts and presenters. I relate to her “keep it simple” accessible style. She’s one of the most sought-after presenters at the conference. Many of us waited in line to get into her session last year. It was a highlight of my time there. Mark Schaefer: Mark Schaefer has been one of my go-to sources for marketing advice for some time—yet I’ve never heard him speak in person. If you don’t yet know of Mark, he’s written six books, the latest of which is KNOWN: The Handbook for Building and Unleashing Your Personal Brand. This will be a highlight of the event for me. I planned my schedule around Mark’s session so I’d be sure not to miss it. Ian Cleary: I think Ian Cleary is one smart dude – his practical tips and tools will help you make the most of your content when it comes to repurposing and promoting. You need to check him out, whether or not you’ll be at CMWorld. Influencer marketing: I’m also excited to hear Lee Odden present on influencer marketing. It can be tough to get this right, but influencers are a strategy many brands want to leverage. It’ll be great to hear from one of the top minds in this field. Measurement: If there’s one thing EVERY marketer needs to know more about, it’s measurement. Andy Crestodina gave what was probably my favorite talk last year. Not only is he super knowledgeable, but he’s a dynamic speaker. Everyone was raving about that talk. So this year, I anticipate nothing less when I sit in on his Google Analytics workshop. Newsletters: I’ll be attending Scott Monty’s session on newsletters and am looking forward to learning some best practices, as this is something I see clients showing more interest in. And with good reason – newsletters can be a great way to communicate with all types of audiences, from customers to employees. Jay Acunzo: Each year, Content Marketing World has a tradition of giving the highest rated presenter a keynote spot. Last year, it was Andy Crestodina, who, for lack of a better term, blew it out the box. This year, Jay Acunzo took the honor, and I’m looking forward to his presentation. Jay espouses unconventional thinking to stand out from the crowd, something we all need help with in today’s noisy world. And how do I choose which sessions to attend when there are so many great ones? I look at the speaker more than the topic. If it’s someone I respect, I tend to sign up for those sessions versus selecting based on the topic only. The lineup is stellar, so it was hard to choose this year. 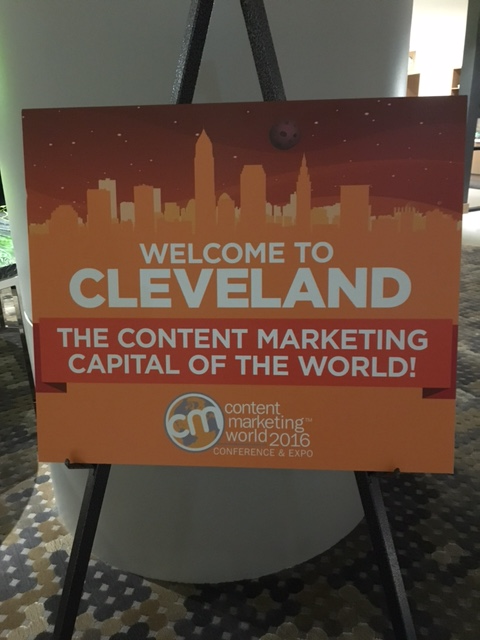 It should be yet another exciting Content Marketing World event. And I CAN’T wait.